Yesterday, I posted about a song that is about the four seasons called, "Around the Seasons". If you missed that post, you can scroll down, or click here. As I mentioned in yesterday's post, I used SMART Notebook software to create an interactive resource for teachers to use with their students. To begin, I created a page for each season. I also split up the song into specific seasons and inserted each song into its corresponding season page. I then used Boardmaker software pictures to represent key words mentioned in the song for each season. (Some of these pictures had to be imported due to the fact that I don't always find what I'm looking for when making picture cards with Boardmaker.) I "cloned" each picture so that as students touch them, they can move them across the smart board screen. Lastly, I created empty "boxes" to serve as "answer spaces", where students will drag their pictures. 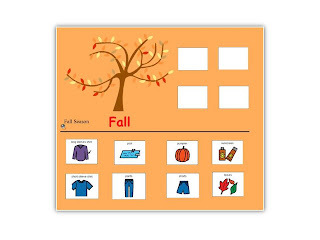 Students first listen to the song, and then try to recall what they heard and which pictures are associated with that specific season. The students can come up to the SMART board to touch and drag their answers to the empty boxes on top. Many teachers reported that this was a great tool to assess their students individually, in terms of what they chose when they come up to the board. A teacher can select a student to choose the answers they think are correct, and then review why their answers are right or wrong. After that, the teacher can play the song again (see the speaker icon on the left side of the pic? ), and students can be involved in checking their answers. And since each season has its own page, specific seasons can be reviewed daily, if needed, for repetition in a fun way---with music! As always, thanks for stopping by! If you have any questions please email me at morewithmusic@gmail.com. Today I'm sharing a song that I have shared before. The teachers that I work with use this song quite often, and especially when there is a season change. We all know and observe many different things associated with each season. Some students have a very difficult time transitioning from one season to another. For example, in the summer, we wear less clothes/lighter clothes. Then in the fall and winter seasons, we wear long sleeves, sweaters and/or coats. Many times students have sensory issues with different kinds of clothes and layers, and it takes time for them to transition. With repetition, we try to teach them that we dress according to the weather and that certain seasons are usually associated with certain types of weather. I wrote this song with the above information in mind. I also created an interactive resource using SMART Notebook software, that provides visual and auditory support using this song. Stop by tomorrow for Around the Seasons part 2, and learn more about how teachers incorporate this song with their SMART boards! Summer seems to be flying by around here. That's usually the case when you take a vacation or have time off. I've been working my way down my list of songs to share here on More with Music. Today's song post is about opposites. Opposites are different! If you think about it, young students work on matching and finding the same with many kinds of manipulatives. Then we work on finding things that are different (i.e. sorting different colors, different textures, different sizes, different animals, etc..). Then we have opposites, which are different, but an extension of "different". Sometimes opposites are more abstract to some students. So, I wrote a song to help introduce opposites to students and included several examples. I recommend singing the song first and introducing it to the students. Then you could use/hand out picture cards with the words on them. If working with a group, you can divide the students into partners ahead of time or just randomly pass out the cards. If randomly passed out, the students have to find the "opposite" to their card and pair up with that person. You sing the song and when you come to one pair sing, "You say..."(and one person calls out their card), and you say, "...(and the other person calls out the other card). It's a good way to give everyone a turn within their pairs. If you are workingn 1:1 with a student, you can ask the student to find the opposite to any given card or ask them to find the opposite from a field of 3 or 4 cards (once they get the hang of it). Then you could even let them match all of the opposites and then sing the song and let the student decide the order of opposites they are going to sing. The possibilities are endless! What songs do you use to help students learn opposites? Today I'm sharing a song to help students with a skip counting and specifically skip counting by 2's. Skip counting helps us count groups of things quickly. Skip counting also sets a great foundation for when we do repeated addition, which happens when we do multiplication. I have seen several ways to help students learn to skip count. Some of those include number lines on their desks, beads on a string across their desk, using an abacus, using a 100's board, and even using a large number line taped on the classroom floor. These are all great tools. I personally love the large number line on the floor because of the way the students become engaged stepping and skipping from number to number. I think it's a great way for the kinesthetic learners in the classroom to grasp the concept quickly. I wrote a song called, "Counting by 2's" to help introduce the concept of skip counting by 2's. When first learning to count by 2's, the main concept a student needs to grasp is instead of rote counting, they are starting with one number and then skipping over the next. Do you need a song to help introduce a concept to your students? I would love to help! Email me at morewithmusic@gmail.com and share your topic or concept request. Today's post is a song share is in response to a question I received from a reader here on More with Music. "I'm a preschool teacher with many years of experience. I love singing songs and using music in my classroom with the students. At times, especially with the mix of students I had this past school year, I had a time getting all the students to specific groups like circle time, reading time, etc.. Once I get them all to the designated area in my classroom, many of the students have the "wiggles", and a few students take a few moments to transition into the group activity. Do you know of any songs to help with this? I'm looking for a "standard" I can do each day to signal this group activity beginning. Thanks!" I love that Anne already uses music in her classroom and sings with her students! It sounds like transitions are the most challenging n her classroom, and with preschool students, this is totally normal. There are many reasons for this, (which I won't list here today), but the truth of the matter is that preschoolers wiggle...A LOT! But, they can also sit and listen. To be really successful with preschoolers , also known as "wigglers", you have to find ways for them to get their wiggles out. 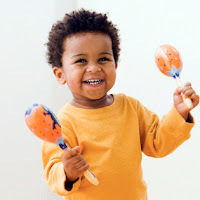 Simple songs involving clapping, patting, stomping, jumping, and/or stretching,etc.. are all great ideas to do BEFORE you ask them to sit down and listen. After getting most of their wiggles out (are they ever completely out of wiggles?!?! ), you can use a song to help transition them to a more quiet, focused group activity. One song I have heard for many years is called "Time to Listen". It's a perfect song to help little ones calm down while reviewing some rules of circle time. I do not know who wrote this song, but I have seen it shared several times on preschool sites online. Since I didn't write this song, I'm posting this song as a free download. All you have to do is click on "download" and you will quickly be on your way to having the song to use with your very own wigglers! Do you need a songs for your classroom or certain transitions within your classroom? Request songs specific to your classroom needs and topics by sending an email to me at morewithmusic@gmail.com. I've been working on several songs lately and can't wait to share them here on More with Music! One song I've been meaning to share (and recently added some extras to), is about plants. This song helps students learn the four basic parts of a plant: the roots, stem, leaves, and flower. As always, thanks for stopping by! Stay tuned for more song posts this summer! Lately, I've been going through all of my songs that I've written and I've started a list of songs to share this summer here on More with Music. Today's song share is one that has to do with weather. I call this song "Climate song" and it helps students understand more about climate. Mark Twain is quoted for saying, "Climate is what we expect, weather is what we get.". I think this quote is a wonderful way to explain climate to students. Thanks for stopping by! Stay tuned for additional songs over the summer. The weather is getting warmer and warmer and there's only one more week of school (plus a couple of work days for me). I'm ready for summer! I've shared today's song post before, but today I'm adding additional ideas for using this song with small to larger groups. The song is called "Play and then FREEZE!". Many students have a hard time controlling their impulses. When the song directs students to "FREEZE", students have to use self control in order to stop playing their instruments. They have to resist the impulse to continue playing their instrument and stop playing instead. This is easier said then done for many students, but the songs allows them to practice this skill in a fun way. Once students practice freezing and have pretty good impulse control, you can incorporate a few additional ideas with this song. If you have a smaller group of students, you can introduce new instruments and/or instruments that require following specific instructions with this song. Each student can have a turn playing the one instrument and when the song says "Freeze", the student stops and you pass the instrument to the next student. Another idea would be for small or larger groups. You would need pictures or extra instruments to hold up as examples. Students all pick a rhythm instrument and you hold up a picture or sample of the instrument you want to play during the first verse of the song. At each "FREEZE" you hold up a different card, signaling those students to play their instruments (i.e. drums play one verse, then bells, then rhythm sticks,etc.) This way, students have to control their impulses and attend to others while they take turns. The students also have to pay attention to figure out which instrument is playing next and then follow directions. How do you implement the "freeze" in your music therapy sessions? On this last day of May, I'm slipping in one more song post. This song, entitled, "Where will we go? ", helps students understand and practice different directions, or positional words. Positional words are words that describe the location of something, often in relation to something else. Students hear these words everyday, but many need to put them into practice (especially the kinesthetic learners) in order to grasp what these words really mean. I've had a lot of fun singing this song this month with many students (and many different age groups). I use rhythm sticks with this song and the students have been tapping away! When first introducing this song, I visually show students each direction/positional word and we say the positional word aloud while tapping. Next, we give it a try with the song playing and me modelling the directions/positional words as the group leader. The students love to take turns being the leader as well, so I always try to incorporate this as part of the song. I lead the first time, then we do the song a second time with a student leader. You could also assign individual students certain positional words to lead as they are sung in the song. As always, I'd love to hear what you think! Thanks for stopping by and stay tuned for more song posts! My three most recent song posts featured songs about our needs and wants. 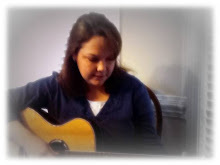 Today I will be sharing a song that fits within those topics. 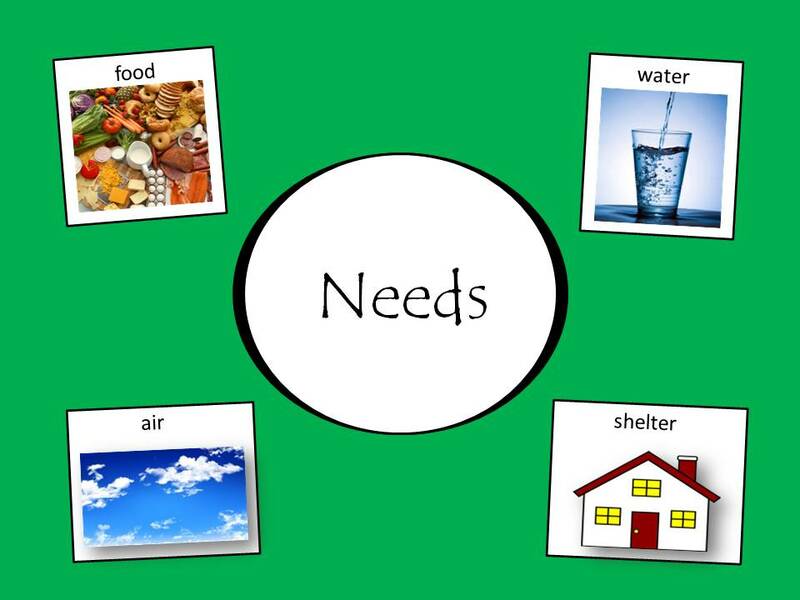 What do we all need to purchase our needs and/or wants??? Money! I used visual aids with this song to show different stores and asked the students, "What would you buy at the book store? ", or "What would you buy at the grocery store?" Many of the students identified the store fronts on the pictures and were very engaged when sharing what they buy (or their parents buy) at the different stores. When singing this song with the students, I used egg shakers. Each student was given a shaker and I modeled "Shake slow" and "Shake fast". On each verse of the song where it sings about a store, we shake slow and find the beat. When the chorus is sung ("You need money, money,etc..), we shake fast. They really like shaking fast, trust me! Isn't it catchy? :) This song is also a great song to sing and warm up the students to talk about money and in particular coin values. How could you use this song? In the past two posts, I've shared songs about needs and then wants. Today I'm sharing a song that groups the two together. This song is really a simple song that helps students understand that needs and wants are two different things. The song defines a need as something you must have in order to survive. A want is something you'd like to have. It is also something that you can live without. 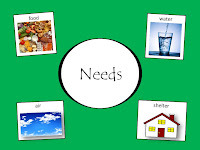 The song lists the four basic human needs and then lists a few examples of things students might want (iPads, video games, TVs). Be sure to stop by tomorrow for a catchy tune! My last post was about the four basic things humans need in order to survive. 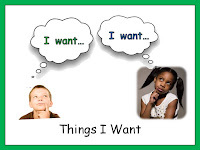 Today's post will be about wants. After students learned the four basic needs, I introduced this song to them. The students were very engaged as I showed them different pictures of toys, candy, stuffed animals, instruments, and games. These categories are all mentioned in the song. I also incorporated sign language with this song. We all signed "I want" along with the song at the beginning of each verse. After singing the song and showing my visuals, I went around the group and asked each student to tell me something they would want. It was very interesting to hear their answers. This was also a great way to encourage students to answer questions and speak in full sentences (i.e. "What do you want?" "I want legos."). So, without further delay, the song is below. I'd love to hear what you think! Thanks for stopping by and check back soon for more song posts!